St. Petersburg’s subway is not very hard to use, though you have to keep in mind some moments. That’s the fastest way to get from A to B throughout the city, and many stations are true pieces of art. Fare is 36-45 rubles. 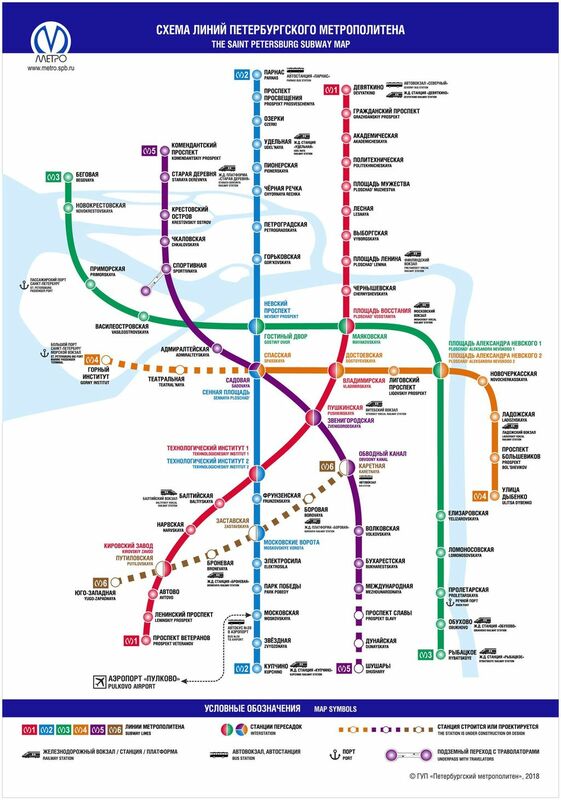 The St. Petersburg’s subway (metro) system runs five lines with interchanges between them (see the map). Each of them has its official name, but the locals refer to them by the names of the colors: red instead of Kirovsko-Vyborgskaya, blue instead of Moskovsko-Petrogradskaya etc. The most of the stations are located underground and four – Devaytkino, Kupchino, Rybatskoe, Parnas – on the ground. See the scheme close up here. 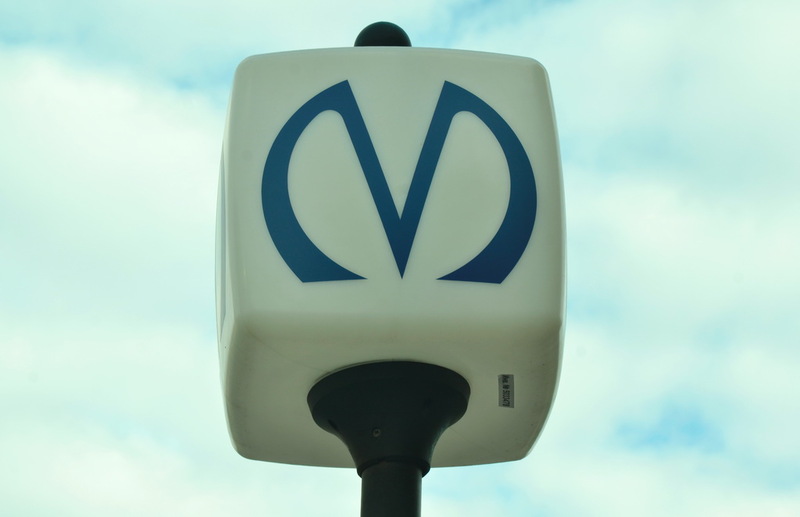 Finding an entrance to a station on the street is easy by the mark M (on the photo below). Stations open every day at 5.30-5.45 and close at 00.00 – 00.45 depending on station. A full listing of stations with their timetables you can find at http://www.metro.spb.ru/rejimrabotystancii.html (only in Russian). If a station has two entries / exits, one of them can be closed earlier, at 20.00 or 22.00 for example. For instance, Dostoevskaya closes at 20.00. In this case you can enter Vladimirskaya station that’s combined with Dostoevskaya and then pass to the trains departing from Dostoevskaya. Travel time in St. Petersburg’s subway varies depending on period. On weekends, early in the morning (till 08.00 am) and late at night (after 20.00) trains go a bit faster, albeit a bit more rarely. — Dybenko – Spasskaya (the orange line) — 20 minutes. 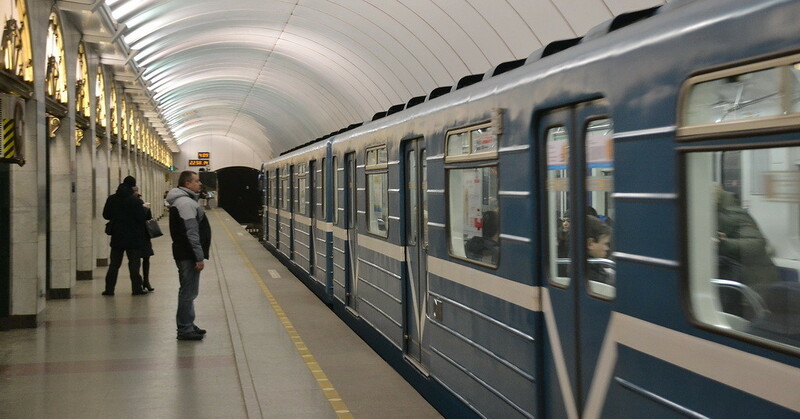 The St. Petersburg’s subway is a single travel zone. A ticket is valid since the moment you have entered and until you have gone out through a turnstile no matter how long you had been inside and how long you had traveled. Fare for a single trip by token is 45 rubles (as of Jauary 1, 2017). You can buy a travel card which gets you a trip for just 37 rubles or less (depending on number of trips). 1) Travel card Podorozhnik (on the photo left). 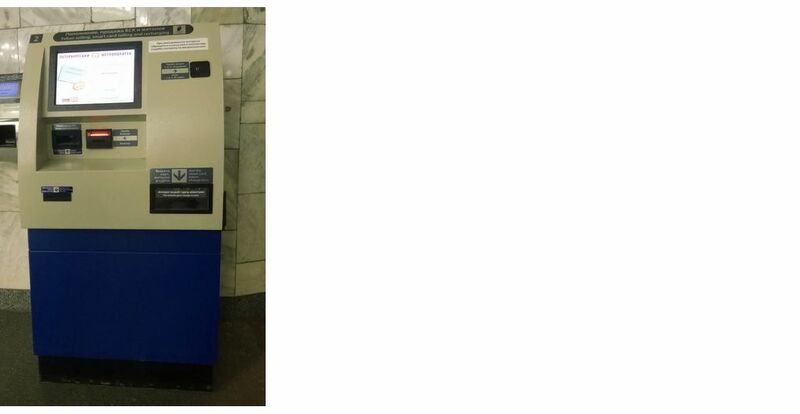 Purchase it at a ticket-office at a subway station for 51 rubles, put some money (up to 15.000 rubles) on it and use it as an “electronic wallet” when paying for transportation. 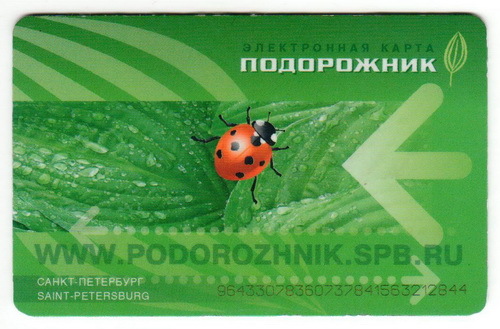 Podorozhnik is valid both for underground and overground public transport, including commercial minibuses («marshrutkas»). Important. You can get back your 51 rubles paid for the card (though it’s still troublesome, only at one spot in the city, and hardly worth it), but you’ll not have refunded your money left on it. Of course, as the card is valid for 3 years since the purchase you have a chance to spend them, but only in case you come back to the city within this period. 2) Petersburg Card that gets you free or discounted admission to museums and attractions and serves as an “electronic wallet” as well. 3) A time limited travel pass gives you seven options, for 1 to 7 days, are available. A travel pass, valid on all public transport in St. Petersburg, provides you with unlimited travel within a period you have paid for. You can purchase tokens and cards / recharge cards at a ticket office and with the help of automated machines (on photo below). Important. One of the stations, Tekhnologichesky institut (Technology institute), is designed not like the others, and this can confuse you or even send you in the wrong direction. What’s the difference and why it’s important to know? When you’re coming from station A to a traditional station B, then cross the platform to take a train, you’ll come back to station A. In the case of Technologichesky institut it works in another way. See the map of the subway above. If you come to Technologichesky institut from the direction of Kupchino (for example, from Moskovskaya), then cross the platform and catch a train, you’ll go up along the red line in the direction of Devaytkino. And on the contrary, if you come from the direction of Devyatkino and cross the platform, you’ll go further down the blue line. It’s been done to reduce transition time and the amount of movements a passenger has to make. When choosing a hotel, keep in mind a few the busiest stations and routes. First of all, it’s right for the red line between Prospect Veteranov and Tekhnologichesky institut. Prospect Veteranov is in the center of a huge urban area serving more than million inhabitants. Crowds are flooding the station every morning on weekdays, and sometimes people at the next station Leninsky prospect cannot get into an overinhabited wagon. We would recommend you to avoid this stretch of St. Petersburg’s subway system if you plan your trip between 07.30 and 09.00. Other difficult stations are Prospect Prosvestchenya and Vasileostrovskaya, both in the morning and in the evening. Less occupied lines are the violet (except Staraya Derevnya and Kommendantsky prospect stations) and the orange ones. If you have any questions, don’t hesitate to ask them here, in comments. We will answer them.